What should be the best meteorshower of 2010 will occurin a little over a week beginning on the evening of Monday, Dec. 13. Like most meteor showers, theGeminids will be at theirbest after midnight (early on the morning of Dec. 14), when the Earthisheading directly into the meteoroid stream. But some will be visibleearlier inthe night, on the evening of Dec. 13, because the meteors? radiant ?where theyappear to originate ? is nearly circumpolar, so they will stay in viewabovethe horizon all night. 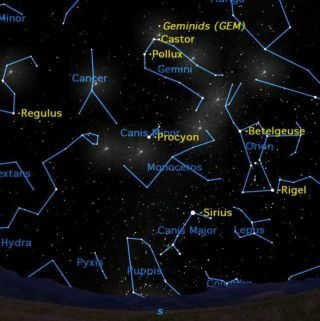 This sky map shows where to look tosee the Geminid meteorshower. Most meteorshowers are caused by fragments of old comets scattered alonga comet?sorbit. When the Earth passes through a comet?s orbit, it sweeps up thefragments, which are heated by friction with the Earth?s atmosphere toincandescence, and are visible as bright streaks of light. The Geminidshoweris unique in being associated not with a comet, but with anasteroid ? 3200 Phaethon. Phaethon is a very odd asteroidindeed. Its orbit bringsit closer to the sun than any other known asteroid, well insideMercury?sorbit. Its orbit is more like that of a comet than an asteroid, but ithasnever exhibited any of the features which characterize comets: no coma,no gasjets, no dust tail. When we look toward the radiant ofthis meteor shower, weare looking into the line of Phaethon?s orbit. The meteors appear toradiatefrom this point in the sky, but this is an effect of perspective, muchasrailroad tracks appear to diverge as they get closer to us. The Geminids? radiant is, as thename implies, in thedirection of the constellation Gemini, just north of the northernmostofGemini?s two brightest stars, Castor. In the early evening of Dec. 13,theradiant is low in the northeast. By 1:00 a.m. ET, after the date haschanged toDec. 14, the radiant is almost directly overhead. By 6.a.m., when theshower isat its peak in the Eastern time zone, the radiant is low in the west. This circumpolar pattern for theradiant means thatmeteors may be seen all night long, though they tend to be faster andbrighterafter midnight. It will also help that the moon sets close to midnight,allowing fainter meteors to be seen. How do you observe a meteor shower?The first thing is todress warmly ? much more warmly than the weather might normally makeyou think? because you won?t be moving much. The second thing is to makeyourselfcomfortable so that you can watch the sky: A lawn chair with areclining backis ideal. And a blanket or a sleeping bag will help keep you warm. You don?t need binoculars or atelescope; in fact these will prevent you from seeing themeteors byrestricting your field of view. You want the wide field given by thehumaneyeball. It doesn?t really matter much whichpart of the sky youwatch, as the meteors can appear anywhere. Early in the evening, theyoftenappear low on the horizon; later at night they are most frequentoverhead. Youwill generally see more meteors if you look away from the radiant, asthemeteors 90 degrees away from the radiant have the longest trails. The most important thing is to bepatient. It takes awhile for your eyes to adapt to darkness. Then, there are often longperiodswith no meteors at all, interspersed with more active times when fouror fivemay flash by in a minute. The Geminids are a bit slower moving thantheirsummer cousins, the Perseids, and often end with a tiny explosion ? youmayhear a popping sound. If you?re clouded out on Dec. 13 or14, try the nightbefore or the night after: There still should be quite a few Geminidsabout.